O my God! Card board tubing from Home Depot is just the thing to build the next revolutionary power source! 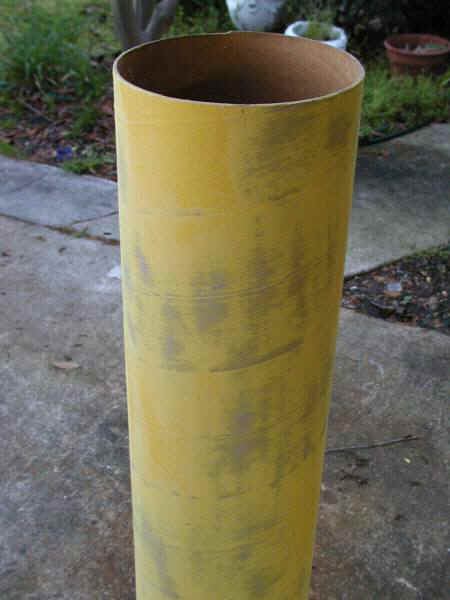 This picture is of the tube with most of the detritus sanded off from it. 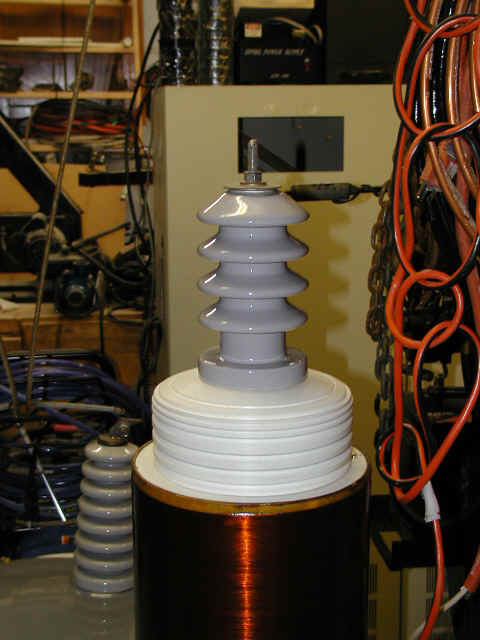 We tested this width between the electrodes of a 125KV x-ray transformer to test for any residual conductance. The tube is now ready for treatment. If you have never seen a Tesla Coil Magnifier, we recommend that you do. This thing is very long and tube like. This tube is very thing and long like. This long thing is very tube like. This is one way to make solid end caps. First take two solid sheets of PVC material to make a nice and sturdy end cap connector. 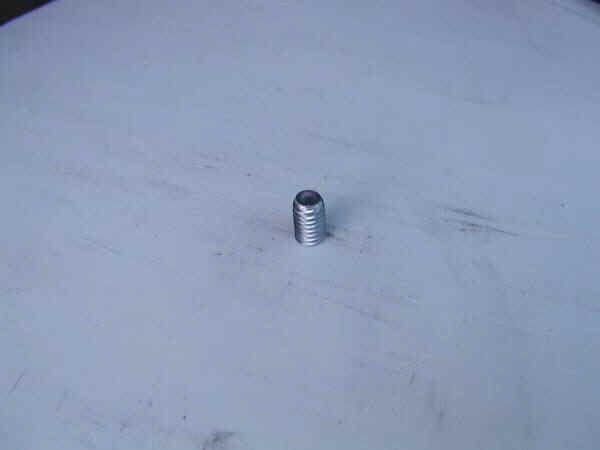 This will provide thick enough material for the final bolt to "bite" into enough of the threads. Below is the final attachment which shows the grounding plane arrangement of an end of a large secondary. This is a good design, since the innermost loop of the primary is most likely to strike into the lower winds of the secondary. By draining the ground through to the center, we minimize the maximum radius of curvature. (We think this makes sense.) Anyway, we fasten the bolt in nice and tight so it doesn't move. 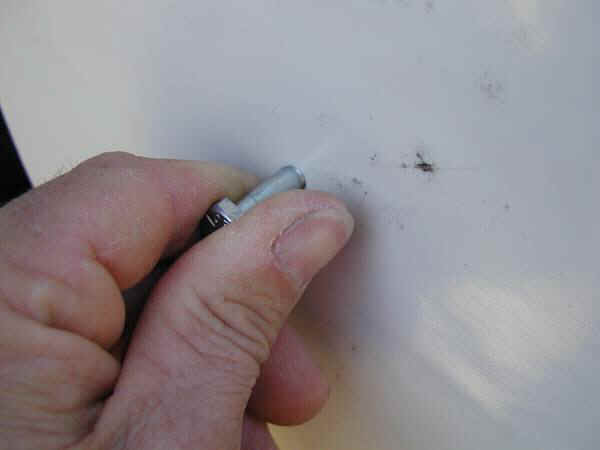 We then rotate the threaded material onto the bolt with glue until it is nice and tight. We did this backwards the first time, so we had to take it back out and glue the correct side, and then start over. 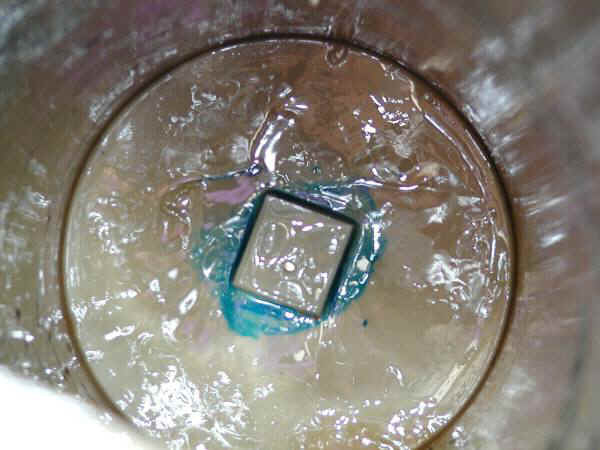 That is why you see glue on both sides. 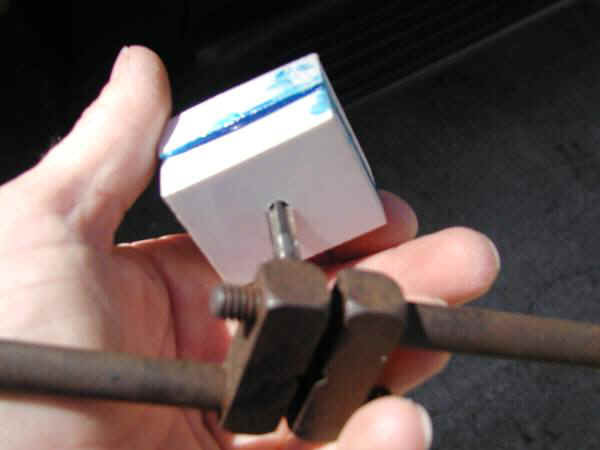 Once the glue is dry, then we remove the original bolt. This leaves behind a nice deep and strong location to attach the primary resonator coil. This design also helps keep internal arcing from starting at the bottom of the coil. This is especially important if you happen to overpower your coil. Hum, who would ever try and do that? 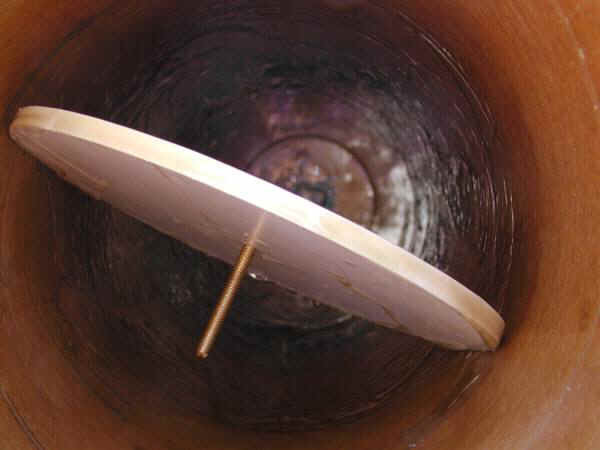 Below is pictured the 8.5 inch round disk for the end. The omnipresent absolute left thumb is used for size comparison. This is the bottom as seen from the top looking down into the inside. 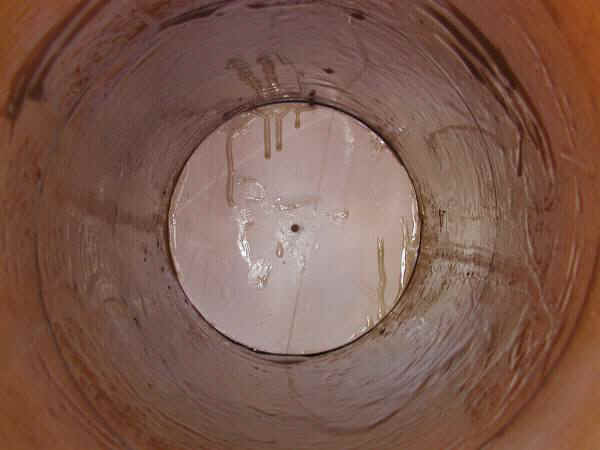 The entire inside of the tube is sealed in fiberglass. 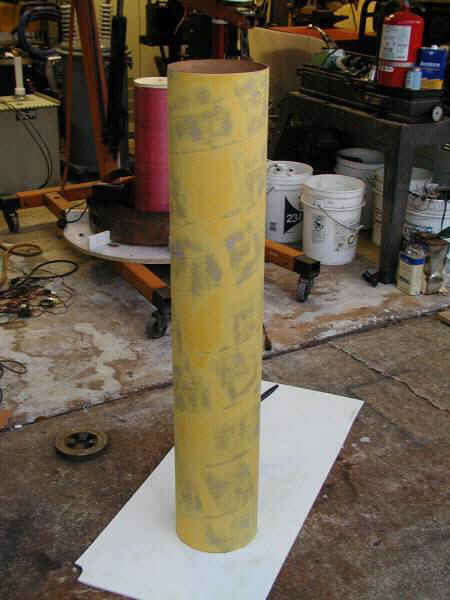 There is at least 1/8 thick layer on the inside of epoxy and fiberglass. 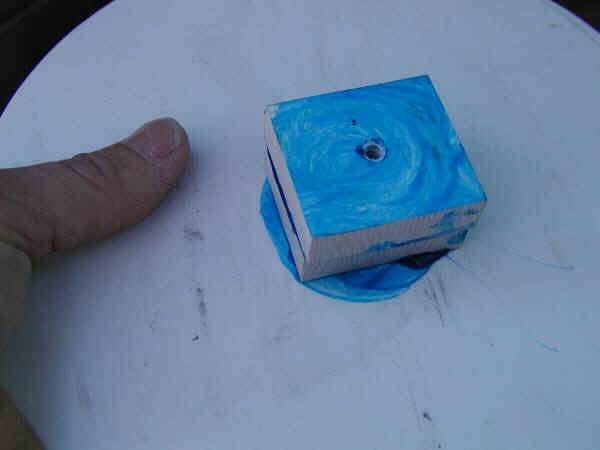 The arc arrestor itself, is used as a tool to "smear" turn the fiberglass and epoxy smoothly to the end. This is a 0-120VDC Volt 2.5 HP DC gear down motor for the large winder. It was removed from a treadmill exercise machine. The gear box is a 20 to 1 ratio. 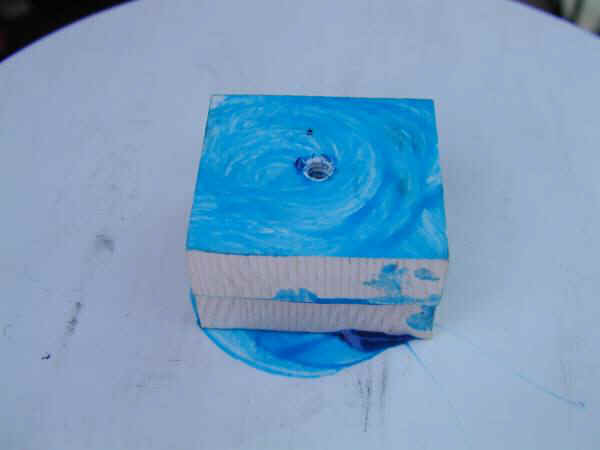 It spins the coil from 0 RPM to 200 RPM. The wire that comes off the spool actually varies in color. There are no gaps in this coil. This is a beautifully wound and tight coil. This coil sure looks pretty after a 12 pack. Just Kidding! 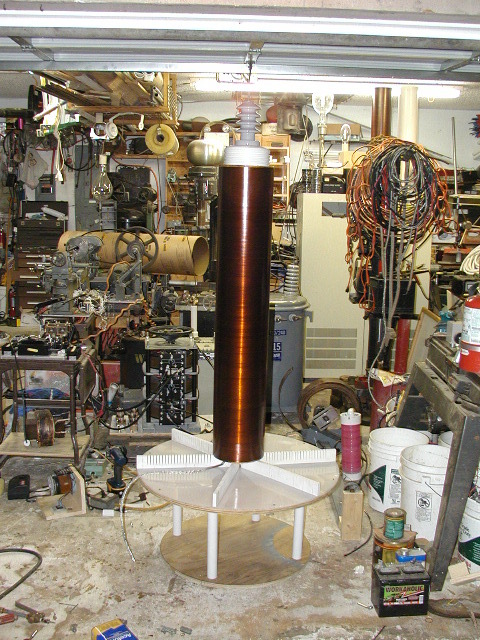 This coil looks gapped, as though winds might be missing, in the picture, but it is actually discoloration in the wire. 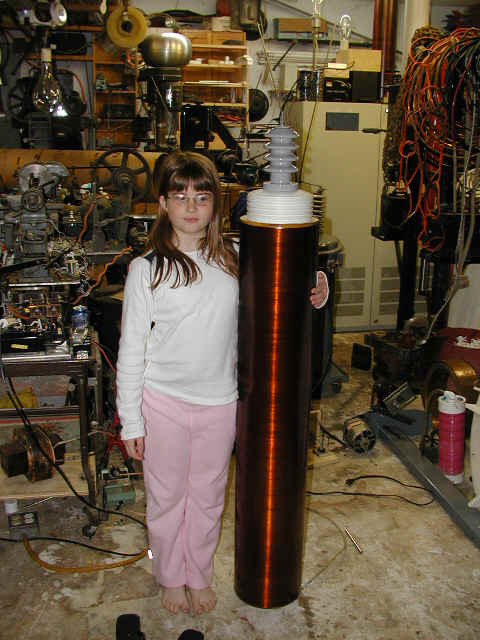 As you can see with our advanced Tesla Coil specialist and inspector, Karina, the brilliant shine does come out. 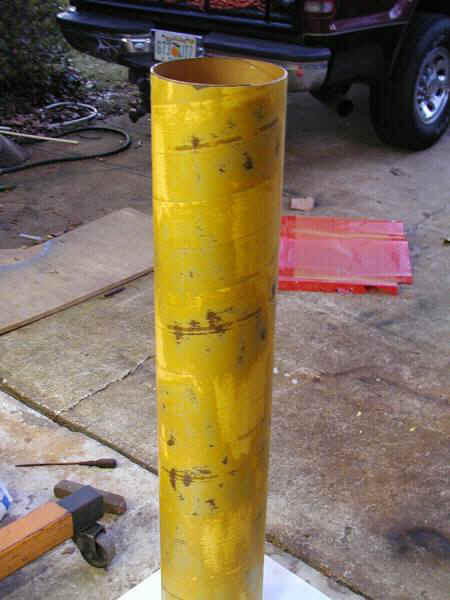 This coil is 8 + 3/4 inches in outer diameter, and the winding length is 47.25 inches. This works out to be a little over a 1 to 5 ratio. #20 wire. 1476.5 turns. Perfect for really high power Tesla Coil work. We are using the standard young girl unit of measurement to provide as a visual aid for size evaluation. Just look at the absolute attention to detail that goes into finishing the top load connector. We may have to form an addition to this laboratory to house and operate the new large scale unit. Please help us expand our line of products and services.